The story of Jonah contains some serious messages, but also great drama – it’s not every day someone is swallowed by a big fish and spat out again! – and a selection of items to be swallowed. First, draw yourself a nice big fish outline. If you plan on making more than one, I recommend creating a cardboard template. Biological/physiological accuracy is not that important, but leave plenty of room for Jonah. 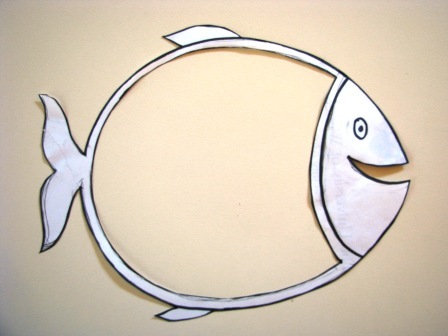 I used my template to cut fish from old cardboard folders, and pasted them onto a backing piece of cardboard, from which I had cut out an identically sized hole.. Alternatively you could just draw a fish onto cardboard and cut out the centre. Draw on the eye and decorate the fins if you wish. 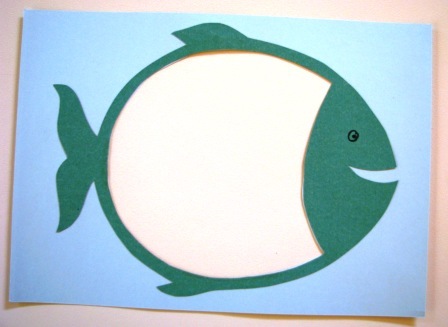 Cut out a piece of contact paper slightly larger than the hole in the middle of the fish, and adhere it to the BACK of the fish, so that the sticky side is facing up. Then feed your fish! I used a paper Jonah (I found a picture on the internet but you could easily draw your own), thin strips of blue and green cellophane, and a selection of marine-themed confetti. 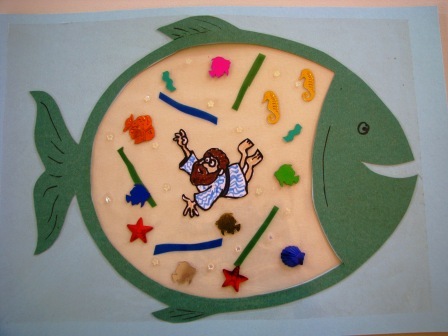 When you have finished, cut another piece of contact paper and adhere it to the front of the fish, sandwiching Jonah and everything around him into the fish’s belly. 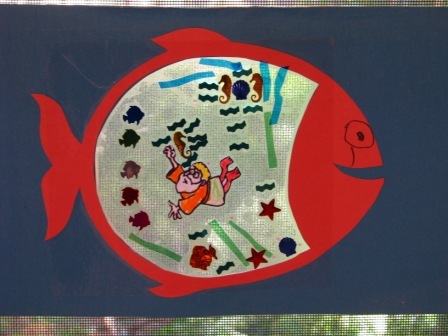 Hang Jonah and the big fish up in a window and let the light shine through.